This chapter identifies and critically analyses the dominant discourses that form the ideological conditions of children’s participation in child protection interventions. The central argument made in this chapter is that the dominant capitalist discourses of individualism and welfare-based paternalism work together to impede rather than enable children’s autonomy. 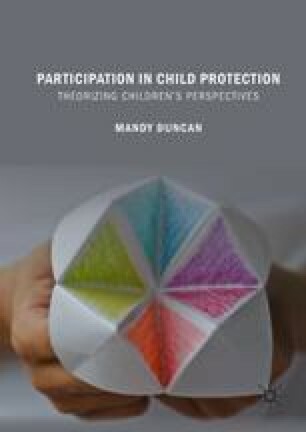 It further argues that there is a fundamental conflict between children’s rights to participation and protection within statutory child protection interventions which provides justification for the widespread denial of children’s participatory rights despite a political ideology that supports the freedom of the individual in the interests of human flourishing. Cameron, D. (2011). PM’s Speech on the Fightback After the Riots. Transcript. Available at: https://www.gov.uk/government/speeches/pms-speech-on-the-fightback-after-the-riots. Accessed August 15, 2016. Glasman, M. (2013). Politics, Employment Policies and the Young Generation. Available at: http://www.lse.ac.uk/economics/newsEventsSeminars/files/MauriceGlasmanPaper.pdf. Accessed August 21, 2016. Legislation.gov.uk. (1989). Children Act 1989. Available at: http://www.legislation.gov.uk/ukpga/1989/41/section/47. Accessed March 19, 2018. Legislation.gov.uk. (2004). Children Act 2004. Available at: https://www.legislation.gov.uk/ukpga/2004/31/contents. Accessed March 19, 2018. Smith, G. (2013). Defending the Non-Aggression Principle. A Reply to Matt Zwolinski. Part 4. Available at: https://www.libertarianism.org/publications/essays/excursions/defending-non-aggression-principle-reply-matt-zwolinski-part-1. Accessed March 19, 2018. United Nations. (1959). Declaration of the Rights of the Child. Available at: http://www.unicef.org/malaysia/1959-Declaration-of-the-Rights-of-the-Child.pdf. Accessed August 20, 2016. Von Pufendorf, S. (1673). On the Duty of Man and Citizen According to the Natural Law. Available at: http://www.lonang.com/exlibris/pufendorf/puf-203.htm. Accessed July 20, 2014.